Tension gripped West Delhi’s Mayapuri on Saturday, as clashes broke out between local shop owners and police personnel during a sealing drive. 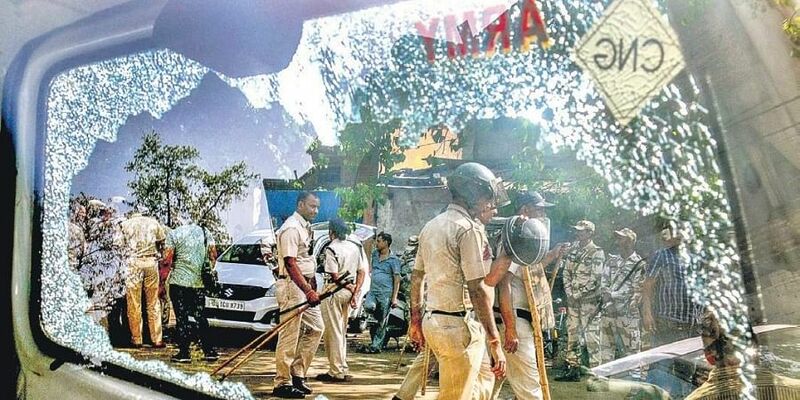 NEW DELHI: Tension gripped West Delhi’s Mayapuri on Saturday, as clashes broke out between local shop owners and police personnel during a sealing drive. The drive was initiated by the Municipal Corporation of Delhi (MCD) in compliance with an order issued by the National Green Tribunal (NGT). The NGT had sought the closure of around 850 ‘polluting’ scrap units in the area. Acting on the NGT order, the sub-divisional magistrate of Delhi Cantonment on Saturday issued a notice directing officials to launch a sealing drive in the area. A team of MCD and Delhi Pollution Control Committee (DPCC) officials soon arrived at the Mayapuri Kabadi market. However, the officials said they had sealed around 6 ‘polluting’ units and were about to seal more when they ran into violent protests by workers of some of the other units. They claimed the workers unleashed an attack on them and the police personnel. “The sealing drive was carried out following the directions of the NGT,” a senior Revenue Department official said. Police said as the sealing drive began, local scrap dealers erupted in protest and even restored to stone pelting. “Fourteen persons, including the SDM, DPCC employees, the ACP and other police personnel, were injured. A case has been registered,” the police said. Videos surfaced showing police personnel being chased around by a mob, pelting stones at them and hurling abuses. On Thursday, the NGT had come down heavily on the Delhi government and the DPCC for failing to curb pollution caused by these scrap units. In 2006, 3 people lost their lives in Seelampur during a protest against a sealing drive. Repeated calls to a spokesperson for North MCD went unanswered.